The Cathedral ceilings and automated skylights keeps air flowing. King sized bed, Cathedral ceiling, skylight and ceiling fan. 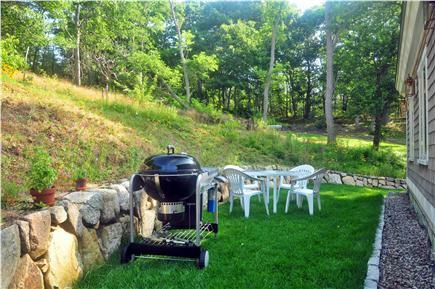 Rear Patio - equipped with a gas grill and dinning for four. Longnook Beach North view is just 1 mile, easy walking or biking. Longnook Beach South View - the most beautiful beach on the Cape! This little gem of a newly renovated cottage nestled on a secluded 10 acre farm is situated one mile from Longnook Beach, the Cape's most beautiful semi-private ocean beach in the National Seashore park. 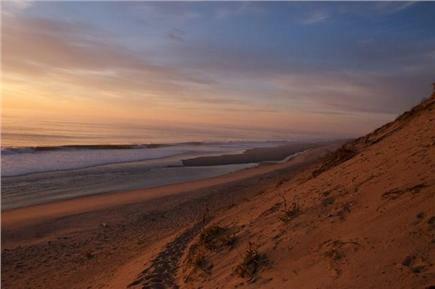 The cottage is adjacent to the National Seashore and offers many secluded walks on the hills of Truro. The cathedral ceilings and many windows overlooking the abundant flower gardens gives a feeling of spaciousness and tranquility. 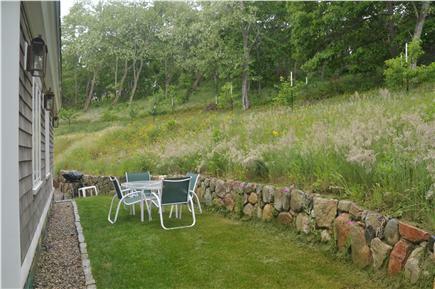 The outdoor shower and private back yard which has a picnic table and chairs both face peach trees and the hills. 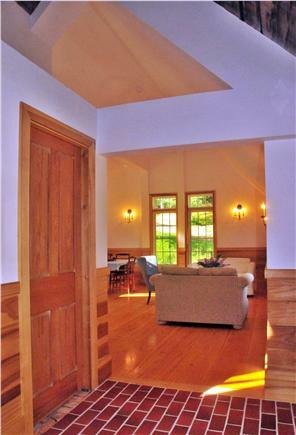 There is a full living room, dining room, kitchen and large porch - and vegetable gardens galore! The cottage is fully winterized with radiant heat. 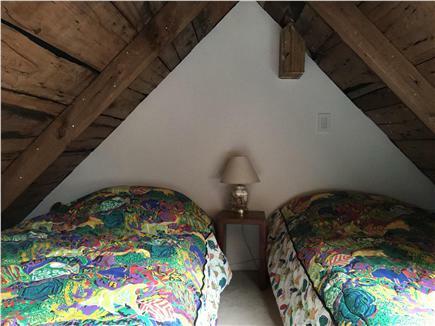 One king size bed in the master bedroom, 2 twins in the loft. 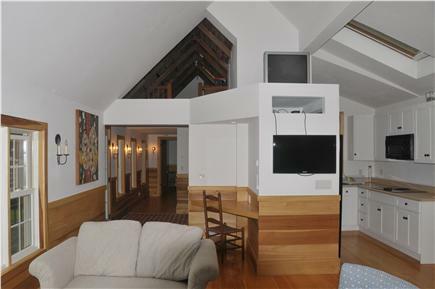 The loft is perfect for children and young adults. 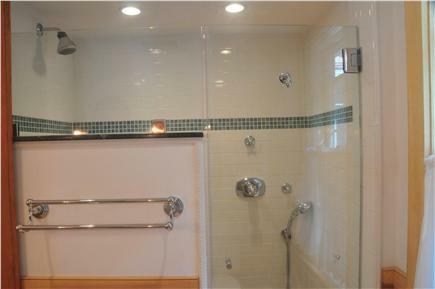 Amenities include a dishwasher, washer/dryer, cable TV, Internet, a gas BBQ grill, and outdoor shower. Additional pricing info: $100 discount for only 2 occupants. $100 cleaning fee. Linens not incl. We do accept on line payment, State and local taxes of 12.45% will apply. 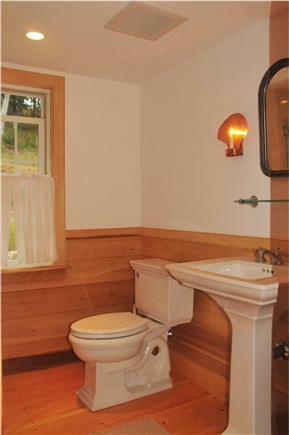 This cottage was perfect for the two of us. It is in great condition as it is newer, and located about a mile or so from Longnook beach, one of the best beaches on the cape. The owners Dilys and Peter were very accommodating and helpful. 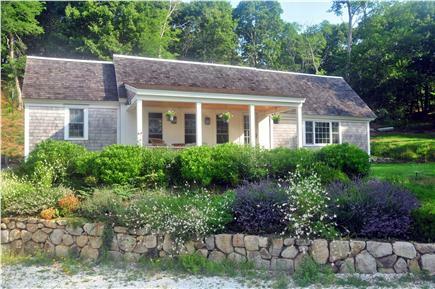 I would highly recommend this cottage as it was a very quiet and peaceful place to vacation while being close to Wellfleet and Ptown. I have stayed on this property several times and always look forward to the combination of natural beauty, peacefulness, and recreational access to beach, forest, and trails. 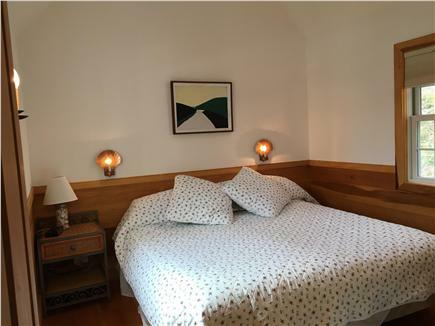 The recently renovated cottage has unique wood features, a clean and fresh atmosphere, and provides a lovely mixture of old character and modern comfort. The property is beautifully landscaped, and if you're curious, the owners will gladly show you their organic orchard and farming operation. This refreshing cottage provides you with unbeatable access to Longnook Beach and the National Seashore's extensive trail system. I love to bike to the beach or along woods roads, hike up the hill into the pine forest covered in lichens, and stroll down the surrounding roads and trails to look at the pretty houses and interesting plant communities. A little piece of heaven! We have been staying in this cottage for most of the summer for the past 6 years. I cannot say enough about Peter, Dilys, their family, the property, and the love and care that this cottage exudes. 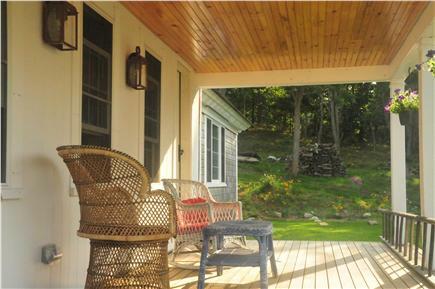 The cottage is open, airy, and relaxed. It's the perfect place to spend your summer days. The kitchen and bath are upscale, and the skylights (which open and close with a remote) circulate air throughout so it's never stuffy or hot. We love sitting on the front porch. It's a great spot to read or watch a summer storm roll in. The living room is stocked with games and puzzles, and the whole property feels more like home than a rental. We will miss it tremendously this year, and hope to come back in the future. Enjoy!! What can we write that hasn’t previously been written about the cottage at Longnook Meadows Farm? Perhaps the best thing to report is that as of May 2015, the magic of a stay here continues. It is everything this website shows and more. The setting is wonderful. 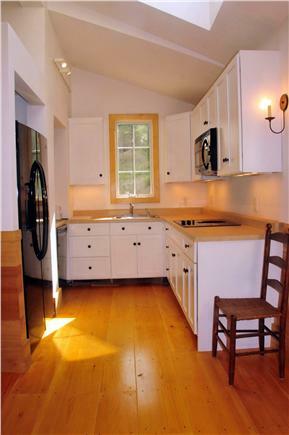 The cottage is bright and airy with new kitchen appliances, very tasteful appointments and oh, so clean! Best of all, comfortable and relaxing. Trees, shrubs and flowers fill the beautiful yard, making either the front porch or backyard a perfect place for a morning coffee. Quintessential hosts Peter and Dilys are warm and accommodating—respectful of your privacy, though ready to be found at a moment’s notice should you need them. 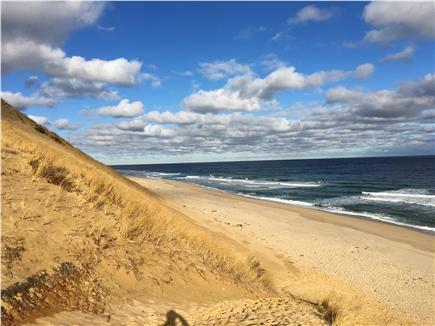 They are always spot-on with a good recommendation for dinner or some fun Cape activity—Truro or Wellfleet galleries and dining, P-town shopping and restaurants, Truro Vineyards, Cape Cod Light and beautiful Longnook beach. A special connection? The farm supplies local restaurants, Blackfish in Truro, Mac’s Shack in Wellfleet, and others with their organic produce. You know it’s the perfect place when you are planning a return trip the day you arrive (and we are!). 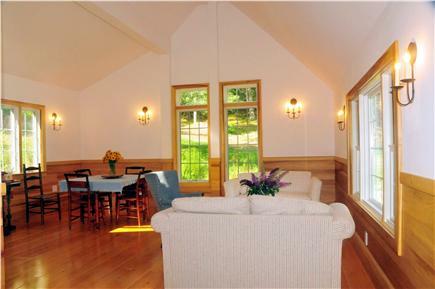 We absolutely recommend Longnook Meadows Farm Cottage for your Cape Cod stay.